The most famous wide-temp Casio of all is the WW-5100; in fact if you’ve ever heard of a wide temp Casio watch, it’s a pretty good bet the 5100 is the one you’re thinking of, or possibly the other wide-temp G-Shock, the WW-5300. But they weren’t the only ones Casio made. Not that there were many. I’m aware of only three other models, the WW-710, the XC-30, and this one, the WW-28. It uses module  and is the wide temperature (-30ºC to 50ºC range) version of the W24 and all other models (marlins and others) that use the  module. 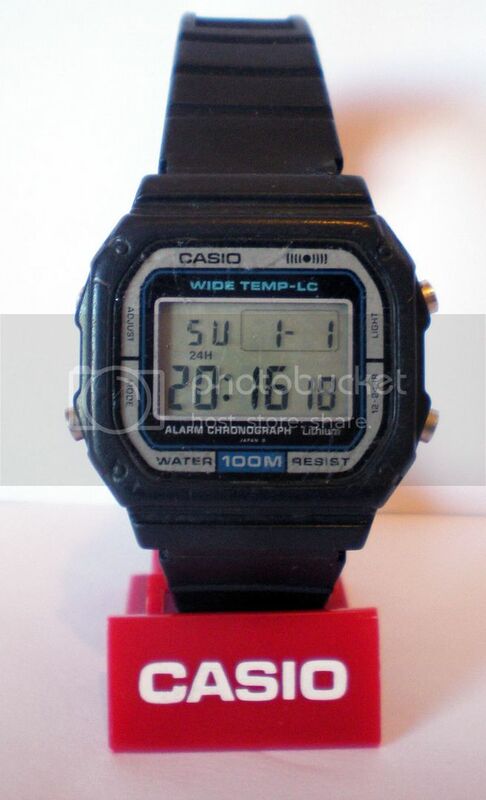 It appeared in the 1983/84 catalogues, which also featured the WW-5100 so Casio must have been trialling the wide-temp LCDs in at least two models to see how they’d sell. Unfortunately they didn’t sell well. Part of the reason behind the WW-5100’s popularity is it’s rarity, and it’s rare because Casio didn’t make many of them because they weren’t selling well. And maybe there just weren’t that many people who would go on an Arctic expedition one weekend, and a Sahara Desert trek the next weekend, and needed a watch to cover both extremes. But sitting on your wrist, beneath gloves and a padded jacket, there’s little chance it would have seen -30º on the slopes of Aspen, unless an avalanche struck and at that point, knowing the time would be the least of your problems. How collectable is the WW-28? It’s hard to know. It certainly doesn’t carry the same kudos as the G-Shock versions, although Marlin collectors would be fans of this watch, since it shares the same functionality as a number of Marlin models (and basically the same look) and has the bonus of the wide-temp LCD, although without the fishy picture. At the time I bought this, the same seller was offloading another WW-28, but non-working. The savvy watch tinkerer would salvage a working  module from a beaten up W24 or similar and swap the LCDs over, and bingo! A working, and pretty well genuine, WW-28. NB – the WW-710 looks to have the same functionality as the WW-28 but is not the same module. This is a  and the WW-710 uses a  – go figure!